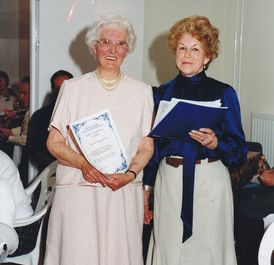 The Friends of the RUH was established in 1957 by a small group of dedicated people. Over the years the charity has expanded dramatically. In 1979 the hospital Shop was opened – run by volunteers in a small Portacabin. It has now moved into much larger premises in the main entrance and is expanding its business each year. In 1983 the Friends saw an opportunity for a coffee shop; from a conservatory building this has now been redeveloped and was opened mid 2014 so please do come and have a look. 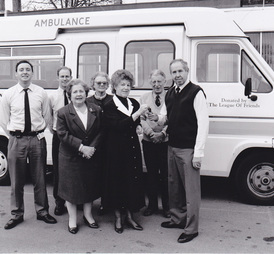 In 1985 the first volunteer teams were formed to help on the wards – serving drinks and providing a listening ear. Recognising the potential, the hospital soon asked us to find volunteers for the out-patient clinics, followed by guides to aid visitors and patients throughout the hospital grounds. We have over 350 volunteers working in many different areas, however, with such a busy hospital we are always looking for new members. In 2014 Friends Charity underwent big changes. The Conservatory Coffee Shop and Friends Office were demolished to make way for a beautiful contemporary redevelopment. 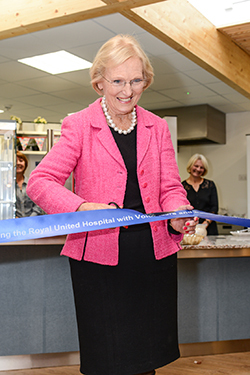 We held the grand opening on Saturday 11th October 2014 and the Friends Coffee Shop was officially opened by the famous Mary Berry, whose mother was the founding chairman of the League of Friends of the RUH nearly 60 years ago. The new Coffee shop offers a relaxing environment for patients, visitors and staff. We are sure it will raise much need funds to pay for patient amenities across the hospital.